I am a member of the Collective Bias® Social Fabric® Community. This shop has been compensated as part of a social shopper amplification for Collective Bias and its advertiser. #collectivebias // It’s getting warmer which means barbecue season is just around the corner! I have a fun series of burgers planned with the super talented Yvonne from Tried and Tasty, but wanted to give you a little glimpse of what to expect! I’ve had these juicy slabs of meat on my foodie bucket list for ages and finally decided it was time to make these inside out burgers! First I needed supplies. I headed to Walmart and grabbed the necessary supplies. The top of my list? Velveeta Slices and some Kraft Mayo. 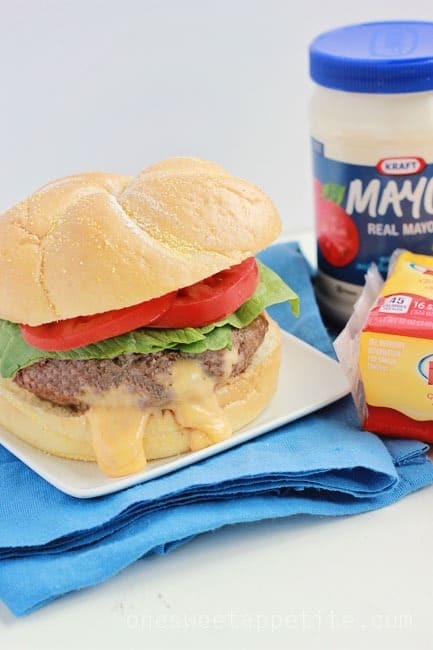 A burger isn’t a burger without a good slice of cheese and nice spread of creamy mayonnaise. 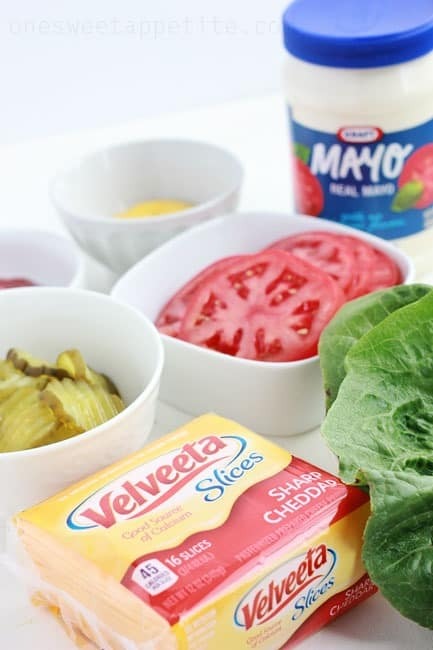 I also made sure to grab tomatoes, lettuce, pickles, and other toppings for those that like a little extra variety. Now, on to the recipe! Head a skillet over medium/low heat. Divide your hamburger in half. Shape both into fairly large thin patty’s. Fold and break your cheese slices into quarters. Pace in the center of one patty. Sandwich with your remaining meat. Pinch and seal the sides. Cook on both sides until the juices of the meat run clear. When you bite into the burger you’re met with ooey gooey melted cheese. Lots of it. 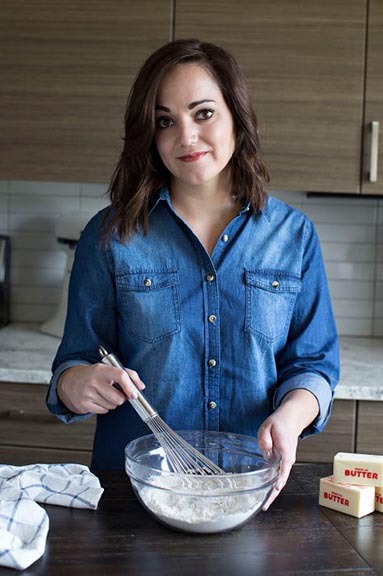 The best part about this recipe is how creative you can get. If you want to add chopped bacon into the center… Go for it! Or how about a cream cheese jalapeno mixture? Maybe just a different cheese like provolone or pepper jack? The possibilities are endless! If you’re up for a little extra something… I like to mix equal parts Kraft Mayo with ketchup to form a yummy spread. 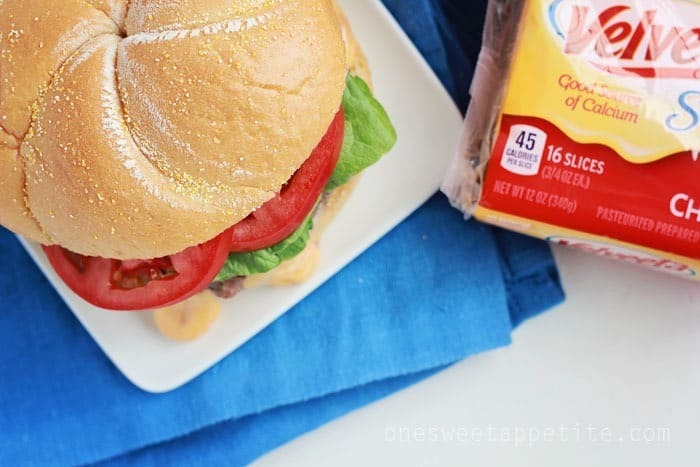 Place it on the top bun to kick things up a notch! What would you use to fill your cheeseburger? Mmm now I REALLY want a burger for lunch! This looks amazing. That gooey cheese! I love cheeseburgers! I think it would be such a fun surprise to have one with the cheese inside. My boys would love it. Nothing beats a good cheeseburger! They are my favorite!!! And we are coming up on the major grilling season. I am so ready for one with cheese! yummy! We LOVE to make this kind of burger! So juicy and delicious. Yum! 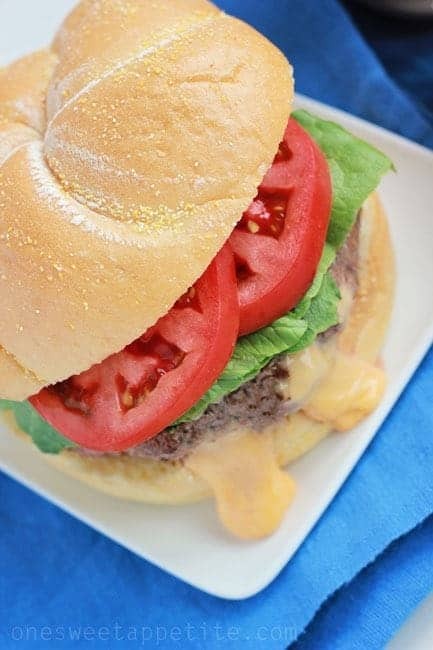 I love tomato sandwiches… we can omit the burger in the summer! Oh this looks so delicious! My mouth is watering! These look delicious! Cheese is a must at our house. Yum! Yum!!! This cheesaholic thinks this recipe sounds divine! I bet my kids would go crazy over this! We will have to try it soon! This looks SO good – and now I am starving! 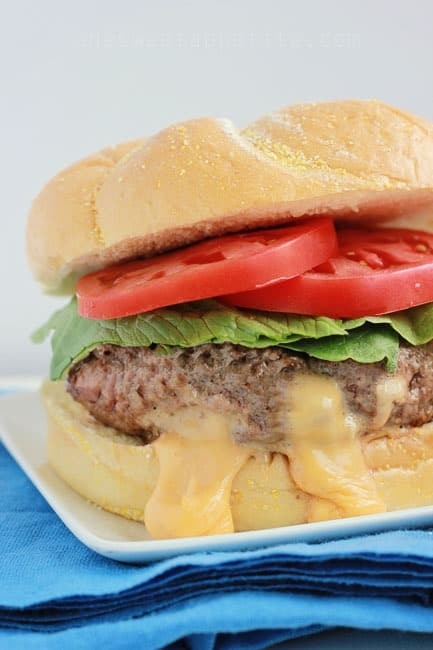 Ooey gooey melted goodness inside of a burger? YES PLEASE!!!!!!!! This looks divine and as always, I love your gorgeous photos! Yum! I have no idea why I’ve never done this before! Delish!